An electronic calculator with printer, manufactured by Wanderer in Germany and sold by Sumlock Comptometer. For some users, accountants for example, a permanent print of a calculation and its result was required. Early electronic calculators with printers were something of a rarity, and the first ANITA model with a printer, the 1011P, was not introduced until 1971. A prototype Wanderer Conti was exhibited in late 1964 and was then the first electronic desktop calculator with printing output. Production was scheduled for 1966. The electronics, using Silicon transistors, was designed and manufactured by Nixdorf which bought Wanderer in 1968. The capacity in input, output, arithmetic and magnetic core memory is 14 digits. Additions and subtractions with full numerical values take a millisecond, while multiplications and divisions take, on average, seventy to eighty milliseconds. However, the speed of the machine does not depend on the time required for computation, but rather the high printing speed of about 240 lines/min. The Wanderer Conti was added to the Sumlock Comptometer range in late 1967, since there were then no ANITA models with a printer. Two models were marketed, the Conti 10R (with 10 magnetic core stores) priced at �085 (about US$3,000), and the Conti 3R (with 3 magnetic core stores) priced at �8 (about US$2,500). John Clements worked as an engineer at Sumlock from 1958 to 1978, and was one of the first to train on the Conti. He says: "I found the Conti machine very unreliable and the mechanical section especially so". Image of the Wanderer Conti enlarged from the advertisement shown below. 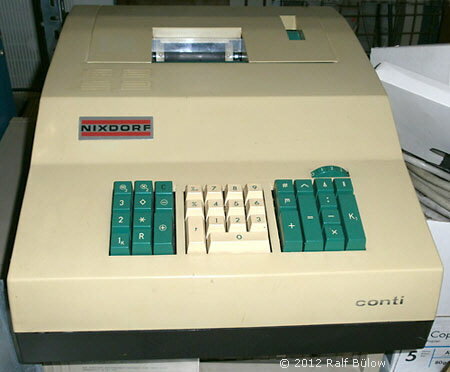 A Conti badged for Nixdorf, at the Konrad-Zuse-Computermuseum in Hoyerswerda, Saxony, Germany. Photograph courtesy of Ralf B黮ow. Advertisement of January 1968 from Sumlock Comptometer featuring the Conti along with ANITA calculators. "Der erste elektronische Tischrechenautomat mit Druckwerk" [The first electronic desktop calculator with printing unit], Der B黵omaschinen-Mechaniker, November 1964, p237. "Die >>Wanderer conti<< wurde vorgestellt: Prototyp des ersten elektronischen Tischrechenautomaten mit Druckwerk in K鰈n" [Presentation of the "Wanderer conti": Prototype of the first electronic desktop calculators with printing unit in Cologne], Der B黵omaschinen-Mechaniker, December 1964, p247. Conti 10R Flyer, Sumlock Comptometer Limited, London, 1968.